Rappelling To End Homelessness! SAVE THE DATE FEBRUARY 2nd, 2019! Have you ever rappelled down a mountain during a vacation? Have you ever wanted to? 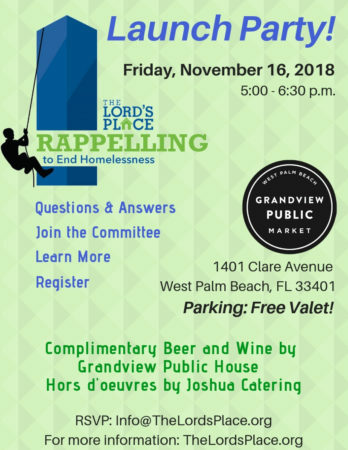 Well , you’ll be hard-pressed to find mountains in Florida, but here’s an option that will raise money for a great cause- helping the homeless- and satisfy thrill-seekers and do-gooders alike: URBAN RAPPELLING. We will be hosting an Urban Rappelling event at the Comeau Building, 319 Clematis to raise funds for The Lord’s Place! Please stay tuned for more information about this event! EMAIL US FOR MORE INFORMATION ABOUT THIS EXCITING EVENT! Rappelling to End Homelessness is a new event for The Lord’s Place. Staffed by the experienced and professional team at Over the Edge(overtheedgeglobal.com), this event will be sure to bring a new daring crowd, and bring The Lord’s Place name and mission to new heights! On February 2, join us at the Comeau Building in downtown West Palm Beach. 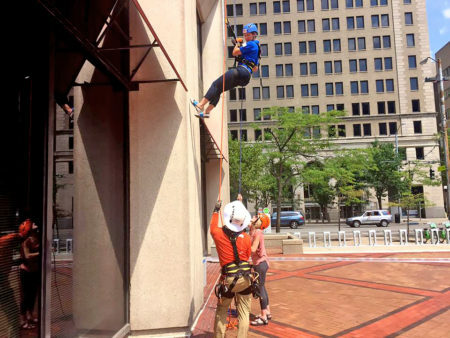 Two rappelling stations will be set up throughout the day, during which there will be regular downtown foot-traffic and the well-attended Greenmarket. Join us as a sponsor, dare to rappel yourself, or “Toss the Boss” where a group can fundraise and the boss is challenged to rappel! Whatever your risk level, there is an opportunity for everyone to be involved! Anyone wh o has the guts and can raise a minimum of $1,000 can rappel. Participants must weigh between 110 and 300 pounds. There is no age limit to participate. It costs $1,000 because this is what it is going to take to help each of our clients end their cycle of homelessness in Palm Beach County! This event is gaining height and speed! Join this fun committee today to help spread the word and increase awareness for the clients of The Lord’s Place. Click here for more details. Too scared to go yourself, how about “Tossing the Boss”? By raising $2,500 or more, employees will have the ability to “Toss the Boss.” Watch out though, companies can set it up with a twist! If employees don’t fund raise the $2,500, the boss can choose who goes Over the Edge. OR, if the $2,500 is met, the boss can match the donation and send an employee! Click here for more details. 100 percent of the funds raised from Rappelling to End Homelessness will go directly to benefit the mission of The Lord’s Place. Registration will open in November 2018, and will be limited to 90 rappellers.